April 15-19 is Work Zone Awareness Week for 2013. We tend to think EVERY week is Work Zone Awareness Week at MoDOT. Just like everyone else, we want to get home safe at the end of our workday. We'll do whatever it takes to help make that happen. In our work, we see too many times what happens when someone behaves in an unsafe manner. We've been called to thousands of crash scenes to help direct traffic while emergency crews and law enforcement assist injured motorists. We've been the first to respond when a car or truck slams into one of our dump trucks. 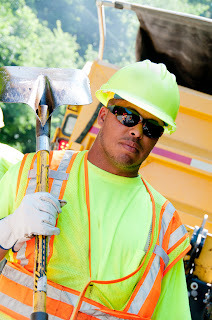 We've called 911 or *55 when an inattentive driver plows into the back of someone observing a slower work zone speed limit. We've held the hands of our dying coworkers and promised to relay their messages of love to their spouses and families. That's why it's a big deal. Now that you know the impact of unsafe behavior, we hope you make safe driving in work zones - and everywhere else - a big deal.